Easy peasy fajita chicken and veggies. Add all spices to bowl and mix together. Remove 1 1/2 teaspoons of spice blend and set aside. Add thinly sliced chicken to Ziplock bag and add 2 tablespoons of oil, lime juice, and remaining spices. Mix well to coat chicken and marinate in refrigerator for at least one hour. Using sauté setting… once hot, add 2 tablespoons of oil, peppers, onions, and scallions. Add reserved 1 1/2 teaspoons of spice blend, mix well, and sauté for about 5 minutes. Do not overcook, they should still have a little texture. Remove and set aside. Do not rinse or wipe pot. Add chicken broth and chicken with marinade. Lock lid and cook for 10 minutes at high pressure. Once cook time is complete, quick-release pressure. Drain off excess liquid and serve chicken in the fajita style of your choice. Once cook time is complete, quick-release pressure. Drain off excess liquid and serve chicken in the fajita style of your choice. 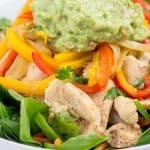 At the time we posted this recipe, we were eating a Whole30 diet, so we added the chicken and veggies to a salad. But you could totally add them to tortillas with cheese and sour cream, if you like. There are no rules!